The Double Closed Top .308 / 7.62x51 Molle Mag Pouch is a double shingle closed top magazine pouch capable of holding (4) M1 style magazines, (2) magazine per shingle. The top closure is fully adjustable for mags of difference length (e.g. 5, 10, 30 Round M1, PMAG, FAL, and Thermold mags). 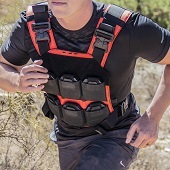 Elastic side straps provide mild retention when just a single mag is loaded per shingle and when the pouch is ran in open top configuration with the closure tucked inside the pouch.